As Julia Louis-Dreyfus and the writers demonstrated so entertainingly in the premiere, the Selina of season seven is significantly darker and more cutthroat than the Selina of season one. Whereas she started the series competent and clear-eyed, stuck in a mostly ceremonial position, in season seven Selina’s desperate and grasping, and making mistakes at every turn. She’s lost any perspective on her own shortcomings and this has made her a weaker candidate, and a less interesting character. It has, however, set up her latest move brilliantly. Faced with a younger, more inspirational primary challenger, Selina pivots from “New. Selina. Now.” to “Man up!” She gives up—at least for now—on non-negative pledges and politic answers and embraces one of her greatest strengths, her talent for bullying. A warier Selina would see the obvious pitfalls of lashing out at Kemi, and how quickly scolding her could come back to bite her. She could be labeled out of touch, bitchy, or bitter, narratives the press would be happy to run with. She could lose support from her base, women like the Kansan she so memorably interacted with in “Kissing Your Sister.” But the Selina of season seven isn’t thinking of these possibilities. She’s defensive, emotional, and ready for a fight, and she channels the resentments that have been festering inside of her for years, picking up on something brewing in the room at the debate and amplifying it, winning over the audience and kicking off a new approach to her campaign. This feels like a defining moment of the primary, and it’s one whose significance Tom immediately picks up on. While other candidates are looking at Selina, Tom is taking in the crowd, his expression knowing and wary. His frustrated stomp off of the stage speaks to an awareness that Selina has found a niche he cannot exploit. The spin coming out of the debate will be Selina versus Kemi, and Tom will be as much of an also-ran as Governor Calhoun (welcome back, Matt Obert!). Selina is no stranger to misogynistic outbursts, but this is by far her most public, and the roar of approval she gets from the crowd ensures it will not be her last. Once again, the writers make the case that Selina’s growing toxicity and lessening self-awareness have made her more electable, not less. If Selina does turn the primary into a mud fight, the candidate most likely to benefit is Jonah. He spends “Pledge” carelessly spouting offensive language and generally being odious. Teddy calls in a favor to get Jonah into sensitivity training, but Jonah manages to break his coaches and winds up enmeshed in yet another scandal, this time due to having written a list of slurs on his hand so he’d know which words to avoid during the debate. This subplot doesn’t work as well as it should. The episode needed a little more time at Crawford Bloom for Jonah to convincingly shock people whose job is training clients not to use offensive language. That being said, the always terrific Timothy Simons is particularly great in these scenes. His casual, unaware delivery as Jonah begins his training works perfectly. Jonah’s actually trying at the beginning, and that’s endearing. Any good will toward him vanishes, however, when he snaps at his trainers for not immediately accepting his apology, speaking in an incredibly offensive voice, mocking a deaf person. Simons commits to the moment and makes Jonah as shockingly repugnant as he’s been. That whiplash, going from clearly offensive but not malicious to undeniably hateful so quickly, highlights just how unqualified Jonah is to hold any public office, let alone the run for president. However, in a battle for the id of a riled-up crowd, Jonah could give Selina a run for her money. Connecting the two campaigns, or soon to be, is Amy, who spends the day getting an abortion, with Dan along for moral support and to drive. Anna Chlumsky and Dan Reid both get strong material this episode, but it’s hard to buy Dan taking a full day off from work to sit with Amy, particularly right before the first primary debate. Perhaps this is an intentional sign from the writers that he’s changing, but it feels more like an inconsistency the show is hoping viewers won’t notice, or won’t mind. Amy’s rant at the protesters outside the abortion clinic is Selina-level, which is to say it’s fantastic, and Chlumsky’s physicality as Amy’s drugs kick in is fun. As for Dan, of course he’s an abortion technology nerd. The episode-ending twist of Teddy hiring Amy away from Selina’s campaign feels like a stretch—why does Teddy think Amy can do a better job than he can, other than perhaps Jonah’s Mommy issues—but if it gives Chlumsky more to do, that can only be a good thing. 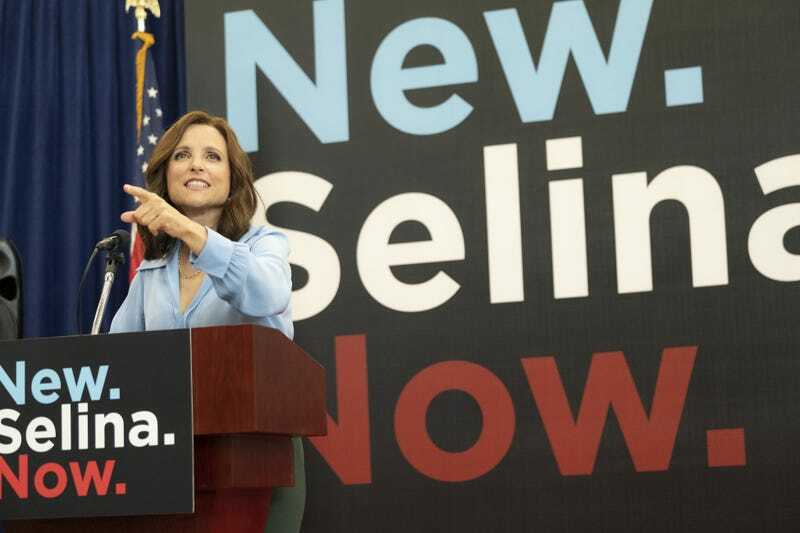 Amy is one of the Veep characters least sullied by her time working for Selina, second only to Sue. Whether she or anyone can keep that up working for Jonah remains to be seen, but given the tone and direction of the season, fans shouldn’t hold their breath. I really enjoyed the various callbacks in this episode, particularly Leon creeping on Amy, “Nev-AD-a” vs. “Nev-AH-da”, and Andrew conning Mike out of his and Wendy’s savings. Mike’s stint on study drugs is entertaining and appropriately short-lived, and Andrew is as smarmy as ever. For more ideas on how to fix America’s failing public education system, tune in to season two of HBO’s excellent and underseen Wyatt Cenac’s Problem Areas. Protest candidate Dumbledore won’t be dropping by, but his proposals to extend the school year and give free breakfast to everyone very well may come up. How I long for the days when I would have found Jonah’s ad over the top or unbelievable. I was actually surprised it tested poorly enough that Teddy wouldn’t release it. I know I already mentioned it, but Hugh Laurie’s performance as Tom takes in the crowd chanting, “Man up” is my favorite reaction in the episode. It conveys so much in a matter of seconds. As in the past two episodes, a whole bunch of familiar faces pop up in “Pledge,” but my favorite bit of casting is Dan Mintz as the guy running the ring toss booth at the fair. Speaking of familiar faces, more Andy Daly soon please! Hopefully the writers are building toward at least one big moment for him later in the season. Given the wonderful Splettnet.net, I really hope we get some form of Spelt family traditions and mottos blog. Richard’s dual resignation to Selina and Jonah was a fun, very tonally distinct moment, and an entertaining inclusion in the episode. It’s hard to pick a best line, but purely on delivery, I’ll go with Gary’s cackle and, “Yeah you would’ve” about Michelle being afraid Selina would beat her up in the girl’s bathroom. Tony Hale is an absolute delight.